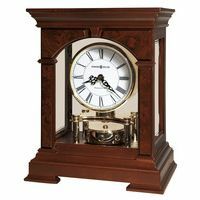 This handsome mantel clock, finished in Cherry Bordeaux on select hardwoods and veneers. Features decorative olive ash burl finished overlays on the front and gold detail on the side glass panels. 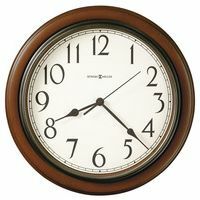 White dial with black Roman numerals, black hour and minute hands, and a polished-brass tone bezel, encased in flat glass on the front and sides. A revolving, polished brass-finished pendulum sits below the dial. 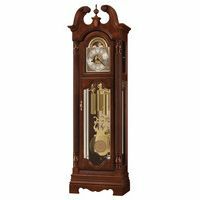 Quartz, battery-operated movement plays Westminster chimes on the hour and features volume control.